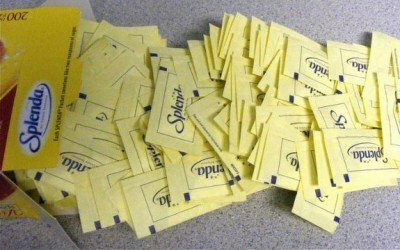 Still using an artificial sweetener like Splenda? You may want to rethink that choice. Like sugar, but not really, Splenda is a chlorinated, toxic sweetener. It has been approved for use since 1998, but this seemingly harmless substance causes leukemia, weight gain, and even obesity. As evidenced in the Journal of Toxicology and Environmental Health, the sweetener also destroys healthy gut flora – an absolute must for a healthy immune system. Due to the ill effects of this chemical in a packet, the consumer watchdog group, Center for Science in the Public Interest, has downgraded it from ‘safe’ to ‘use with caution’. 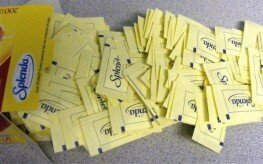 Some studies are even showing that consumption of artificial sweeteners like Splenda have been linked to ‘higher incidence of leukemia in mice‘. It can also cause gastro-intestinal issues like IBS, migraines, dizziness, depression, and spikes in blood glucose levels. Finally, as mentioned, Splenda has been shown to alter the gut microflora, leading to a host of diseases and a compromised immune system. A study found that it ‘significantly depressed’ the gut balance in laboratory animals. Read: Is Splenda Safe? Check out a past NaturalSociety article to read about other dangers of Splenda. Splenda contains 95% dextrose (D-glucose) and maltodextrin. 1.1% is sucralose. Maltodextrin is most often derived from GMO corn. Tapioca maltodextrin is safer, but harder to find and less seldom used by the food industry. Dextrose is not ‘natural’ sugar. It often comes from GMO corn as well. The truth is, you should probably give up all artificial sweeteners, including Splenda, aspartame, acesulfame potassium, xylitol, and maltitol, though they are heavily marketed as safe. Why on earth would you use this artificial sweetener at all, when other natural sweeteners are available – some of them with greatly added health benefits – like honey? Even the company’s website admits it is a chemical contrivance. Dextrose is another name for glucose. It is a pure compound. It doesn’t matter where it comes from. It is still exactly the same compound and has nothing to do with corn or GMOs. It is just glucose!